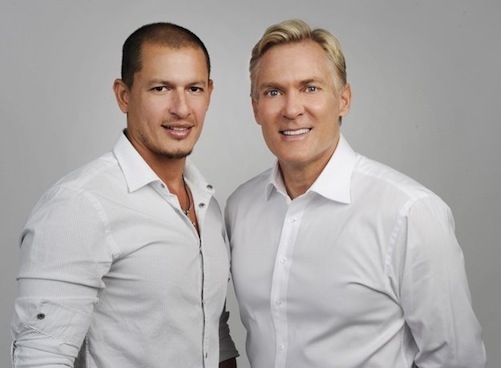 In an apparent first for a Big Four broadcast network, ABC has publicly announced the engagement of Good Morning America weathercaster Sam Champion and boyfriend Rubem Robierb. The above picture also was included in the network's publicity release. "We are thrilled and so excited and thank everyone for their good wishes," Champion says in a statement. ABC says that Champion and Robierb met "through mutual friends" a few years ago in Miami, where Robierb, a native of Brazil, lives and works as a photographer. They plan to wed later this year, the network says. ***Oprah Winfrey's ratings-challenged OWN network has made its biggest programming splash to date by signing Tyler Perry to an exclusive deal. Perry, who produces the sitcoms Meet the Browns, House of Payne and For Better or Worse for TBS, will now be developing two new scripted series for OWN. Both are set to premiere in mid-2013, the network says in a publicity release. "I have been looking forward to the day when we would be in the position to enter the world of scripted television. That day has come," Winfrey says. " We are all energized by the opportunity to collaborate with Tyler, who has a proven track record for producing highly successful cable series." ***NBC has signed Man Vs. Wild star Bear Grylls to headline Get Out Alive (tentative title), an eight-episode reality adventure series scheduled to premiere next summer. The network says it will "test teams of two beyond their most extreme imaginations in the wild." Grylls touts the show as "raw, tough and unrelenting, but it will also inspire and teach the essentials that one day may just save your life. The goal is to empower people with the ultimate in both survival and teamwork, and that brings incredible reward. But first there must be some pain."